I always have a few stained cloth diapers after Poop Day, and even though Mr. Stinky Pants is just going to poop in them again, I still like to clean the diapers and have them looking nice in the meantime. This is especially important if I ever plan to sell them. I usually pre-treat my cloth diaper stains by spraying them with Bac-Out w/Foaming Action Sprayer 32 Ounces before placing in the wash. This usually lifts at least half the stains off my diapers. But for the stains that are left, sunning easily takes care of them. 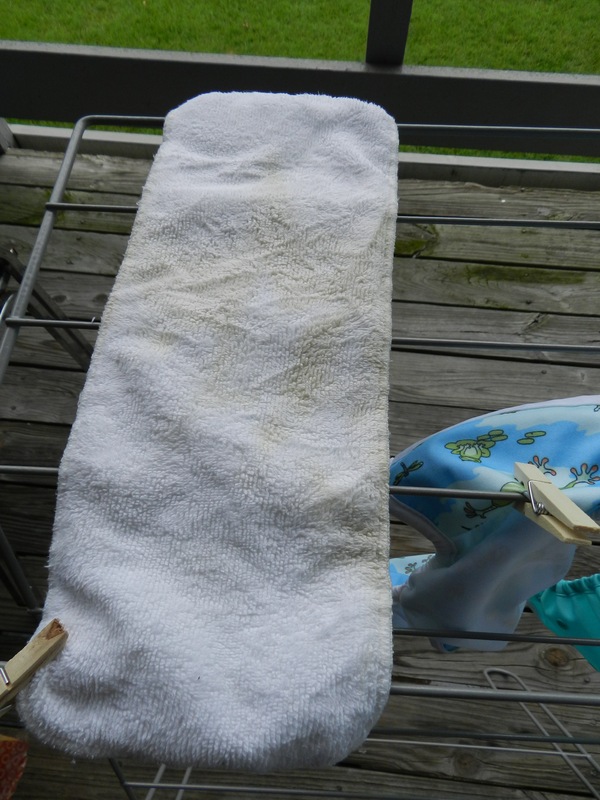 I’d never heard of “sunning” an item of clothing to remove stains until I started researching cloth diapers. It’s a simple process: place the stained item in the sun. It works best when the clothing or diaper is damp. Sunning even works on an overcast day, since it’s the ultraviolet rays that do the whitening. So far, I’ve used it successfully on the white insides of cloth diapers, microfiber inserts, and my husband’s white “cover” (hat) for his Navy dress uniform. I’ve heard it also works to remove deodorant stains from white shirts! Some people apply lemon juice to the stain first before placing in the sun. I haven’t needed to try this yet, since sunning is working fine for me on its own. But, if you have a stubborn stain that won’t come out after sunning your clothes a few times, you might want to try the lemon juice. 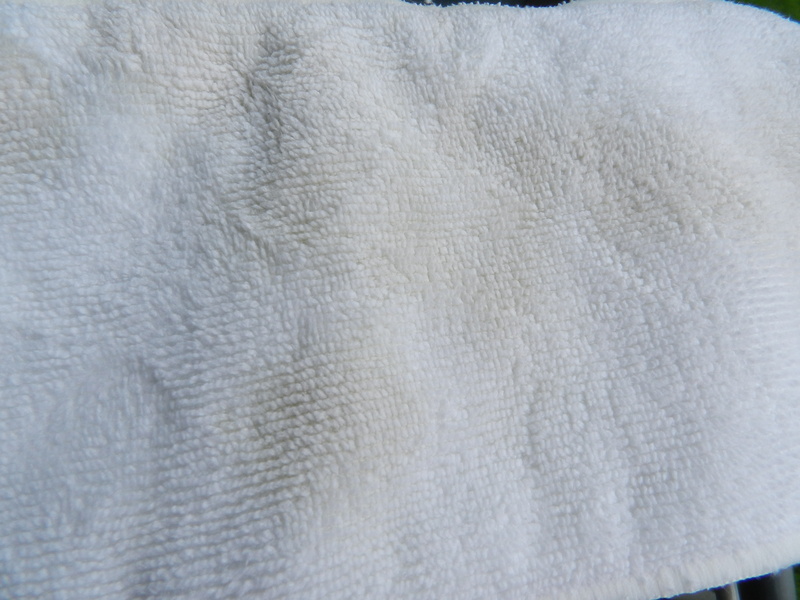 If you use it on cloth diaper stains, make sure you wash the diaper before placing it on your baby. 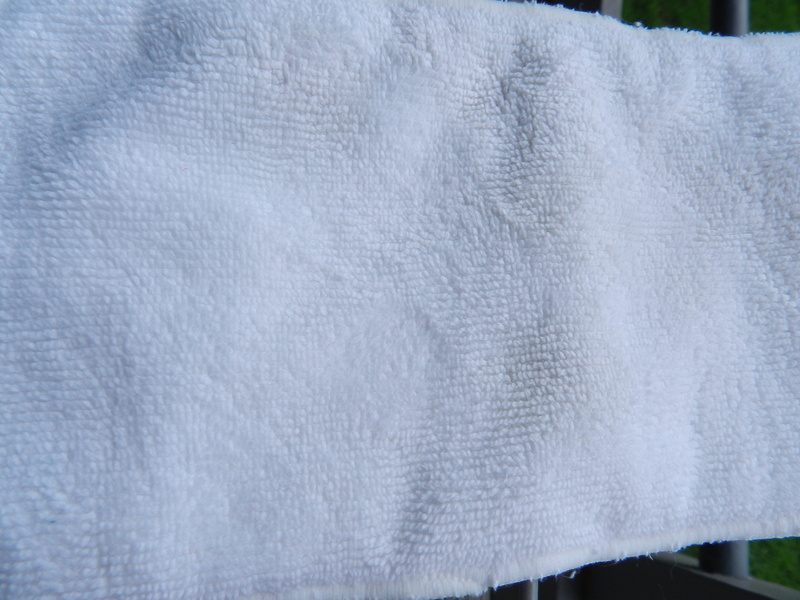 Keep in mind that it may take multiple days of sunning to completely remove a stain. 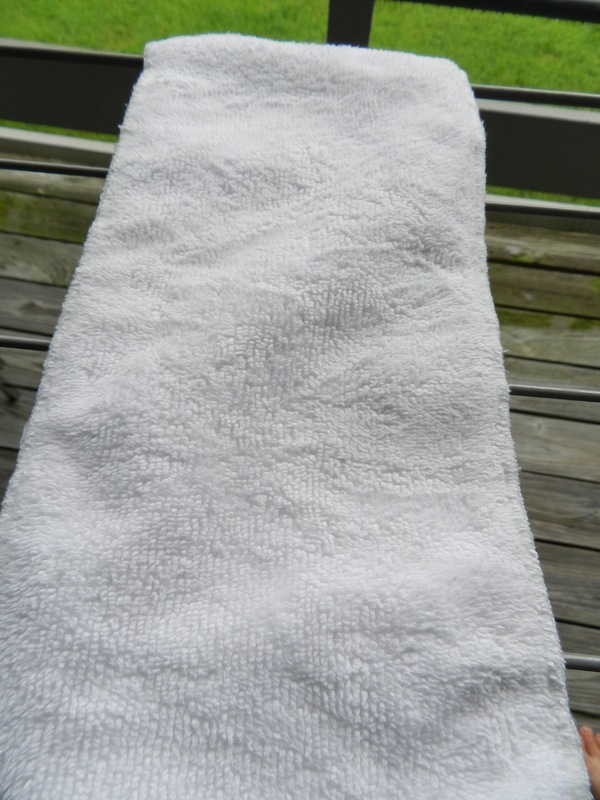 Since heat can set a fresh stain and make it permanent, avoid drying it in the dryer until you’ve sunned the stain out. Insert 1: Click on the images to enlarge. Insert 2: Click on the images to enlarge. As you can see, the stains aren’t gone. BUT, it’s pretty darn close. if I lay this insert out again on a different day (and especially if the sun is out), the stains will fade all the way. Have you tried sunning before? Did it work? How long did it take? Questions? Note: Post contains affiliate link. If this works, you have just changed my life. Really? Hahah! Is there something in particular you want to get stains out of? I haven’t tried to get food or juice stains out yet…just poop stains off the diapers and whatever mystery stains were on J’s cover.